At the edge of the known world, an ancient nomadic tribe faces a new enemy-an Empire fueled by technology and war. A young spiritwalker of the Aniw and a captain in the Ciracusan army find themselves unexpectedly thrown together. The Aniw girl, taken prisoner from her people, must teach the reluctant soldier a forbidden talent – one that may turn the tide of the war and will surely forever brand him an outcast. From the rippling curtains of light in an Arctic sky, to the gaslit cobbled streets of the city, war is coming to the frozen north. Two people have a choice that will decide the fates of nations – and may cast them into a darkness that threatens to bring destruction to both their peoples. 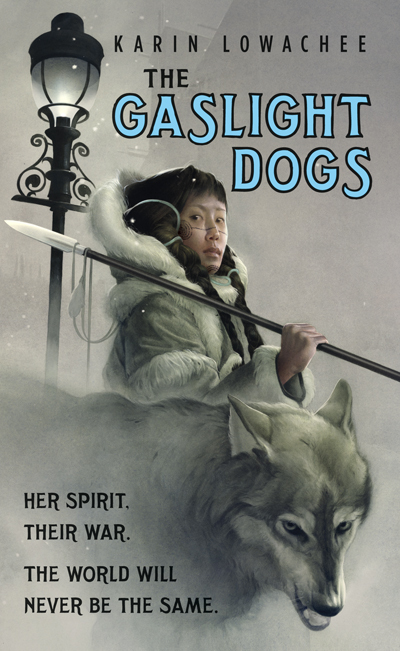 This is the sort of fantasy novel I’ve been wanting to read for a long time. Complex, unique cultures, native versus industrial colonial forces, personal choices that hold political ramifications and consequences. I’ve ordered my copy and can’t wait to get my hands on it. You’re next. 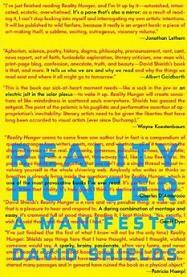 I’m reading David Shields’ new book, Reality Hunger: A Manifesto. It’s a really engaging nonlinear, non narrative, at times lyrical essay, always structured by way of collage or mosaic, appropriating snippets of ideas from other writers, thinkers, poets, and philosophers and critics, arranging in a mash-up style, voices layered over one another without attribution (until the last pages of the book, by compulsion of Shields’ publisher), that approaches the American need–no, hunger–for reality at this point in our history, when it’s evident to most people how constructed our lives are, how posed and self-conscious, positioned, where the boundaries between fiction and nonfiction are fairly thin, and perhaps better for it, when we understand that traditional point A to point B narrative doesn’t suit our understanding or experience of the story of living any longer. It’s a compelling read, and I wanted to blog about it here a little bit to perhaps start a conversation with anyone else who has read it or is reading it. The flood of memoirs of the last couple of decades represents an uprising against such repression. So why have there been so many phony memoirs? Because of false consciousness, as Marxists would put it. Shields (echoing Alice Marshall) is disappointed in James Frey not because he lied in his book, but because when he appeared on Oprah Winfrey’s show he didn’t say: “Everyone who writes about himself is a liar. I created a person meaner, funnier, more filled with life than I could ever be.” After all, just because the novel is food for worms doesn’t mean that fiction has ceased. Only an artificial dualism would treat every non-novel as if it were reportage or court testimony, and only a fear of the slipperiness of life could perpetuate the cult of the back story. “Anything processed by memory is fiction,” as is any memory shaped into literature. But we continue to crave reality, because we live in a time dominated by innumerable forms of extraliterary fiction: politics, advertising, the lives of celebrities, the apparatus surrounding professional sports — you could say without exaggeration that everything on TV is fiction whether it is packaged as such or not. So what constitutes reality, then, as it affects culture? It can be as simple as a glitch, an interruption, a dropped beat, a foreign object that suddenly intrudes. Hence the potency of sampling in popular music, which forces open the space between the vocal and instrumental components. It is also a form of collage, which edits, alters and reapportions cultural commodities according to need or desire. Reality is a landscape that includes unreal features; being true to reality involves a certain amount of wavering between real and unreal. Likewise originality, if there can ever be any such thing, will inevitably entail a quantity of borrowing, conscious and otherwise. The paradoxes pile up as thick as the debris of history — unsurprisingly, since that debris is our reality. I can’t wait to finish it, but had to stop in here to cast a bottle into the ether about it. I’d say this is a book that really approaches the idea of interstitial culture, art, writing, experience. Home again from spending five days in Seattle, where I saw eagles nearly every day (a good omen or portent, I’m told), rode a ferry out to Vashon Island, where I spoke with really awesome, smart high school students about writing, Japan, and my second book, gave a reading at University Bookstore, where I met possibly the best bookseller ever, enjoyed the company of old friends at a local writers dinner (hey Johnzo and Victoria, Ted and Marcia!) as well as the company of new friends (hey Matt and Meghan, Les and Diana! ), and lead a seven hour long writing workshop at Richard Hugo House. Wow, seven hours exhausted me. But I bet it exhausted my students even more. They, after all, were doing most of the writing that day. 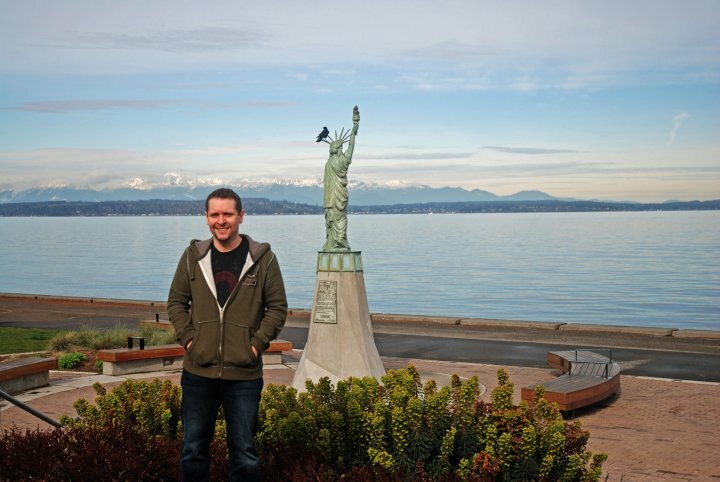 Seattle is a gorgeous, wonderful city, large yet easy to manage, insanely urban yet full of nature reserves, and it seemed the majority of its consumer oriented businesses were largely local, rather than imported from huge elsewhere corporations. And those huge elsewhere corporations that are there seem to largely be locally grown big businesses. There’s a different vibe in the air there, a chilled relaxedness, and this was really a nice change to experience. I look forward to returning when I’m not scheduled to work, so I can climb some mountains, see more islands, more eagles, more owls, and explore the city even further. Thanks to Les Howle for bringing me out! Reviewer and critic Richard Larson has posted an extremely insightful review of Richard Bowes’ Nebula nominated novelette, “I Needs Must Part, The Policeman Said,” on his blog. The idea of the speculative memoir is something of perpetual fascination for me, perhaps because I’ve always treated speculative fiction as a sort of digging below the surface to unearth things that are maybe more real than the visible things, more intimate and fantastic than the things we interact with in our everyday lives. It’s often very easy to believe that there is something magically unreal about everything we experience. Read the whole thing by clicking here.